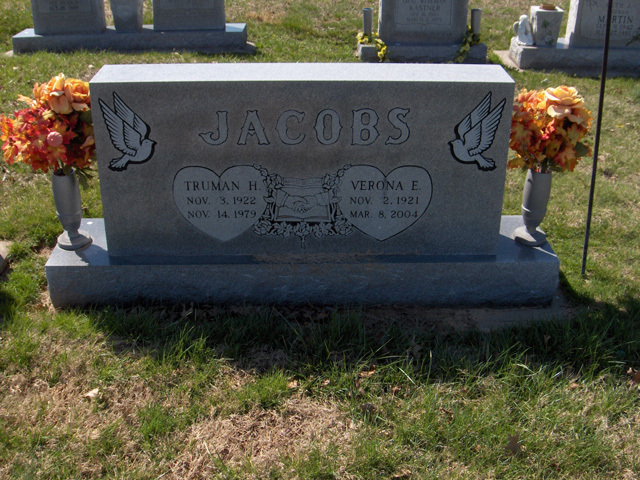 Verona E. Jacobs, age 82, of Marble Hill, MO died Monday, March 8, 2004 at the home of her brother in Marble Hill, MO. She was born November 2, 1921 at Lutesville, MO. Daughter of Wilson Eric and Jattie Vesta Eaker Wiseman, she married Truman H. Jacobs on September 20, 1947 and he preceded her in death Nov. 14, 1979. She retired from Avon Cosmetic Manufacturing Co in Chicago and she worked as a dietitian for the Harvard Hospital in Harvard, IL. She was a member of the Free Will Baptist Church in Des Plaines, IL. Survivors include; one grandson John Jacobs of Florida, four great grandchildren, three brothers, Leo Wiseman, Charley "Pete" Wiseman both of Marble Hill, Jack Wiseman, Effingham, IL. One sister Ruby J. Nanney of Marble Hill. She was preceded in death by her parents, husband, one son John H. Jacobs, one infant brother, Wilbur Wiseman, four sisters; Opal M. Kastner, Elta E. Slinkard, Ruth J. Martin, Oma L. Crites and one Grandchild Jeff Jacobs. Visitation will be Wednesday, March 10, 2004 from 4:00 to 8:00 PM at the Liley Funeral Home in Marble Hill. Funeral services will be Thursday at 11:00 AM at the Funeral Home with Rev. Roy Michaels officiating, burial will follow in the Bollinger County Memorial Park Cemetery, near Marble Hill.